Samoa with its capital Apia is located in Oceania (Oceania, group of islands in the South Pacific Ocean). It covers some 2,832 square kilometers (slightly smaller than Rhode Island) with a population of 200,108. Samoan and English are the languages spoken by people in Samoa. Thiscountry has no land-based border with any other country. Samoa is an island nation in the South Pacific Ocean. It is part of the region of the Pacific known as Polynesia. Its population is around 185,000 but many more Samoans live outside the country, particularly in New Zealand, Australia and California. Samoa is about one-half of the way between Hawaii and New Zealand. The islands have narrow coastal plains with volcanic, rocky, rugged mountains in the interior. The two main islands are Upolu and Savaii. Samoa is a popular place to get married and spend your honeymoon. Several hotels and resorts offer special packages on their web sites and they will make all the arrangements. The topography is two main islands (Savaii, Upolu) and several smaller islands and uninhabited islets with narrow coastal plain with volcanic, rugged mountains in interior. The average density of population is about 71 per km². The climate in Samoa can be described as tropical with rainy season (November to April), dry season (May to October). Potential natural disasters are active volcanism, occasional cyclones and Savai'I Island (1,858 m), which last erupted in 1911, is historically active. To reach someone Samoa dial +685 prior to a number. The local cellular networks are operated on 900 MHz, 3G, 4G. Websites typically end with the top level domain ".ws". If you want to bring electric appliances (e.g. battery chaarger), keep in min the local 230 V - 50 Hz (plugs: I). The sign for the locally used currency Tala is WST. 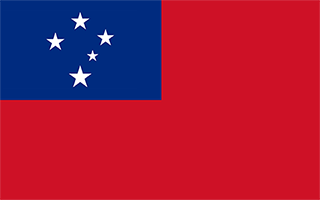 Red with a blue rectangle in the upper hoist-side quadrant bearing five white five-pointed stars representing the Southern Cross constellation; red stands for courage, blue represents freedom, and white signifies purity.